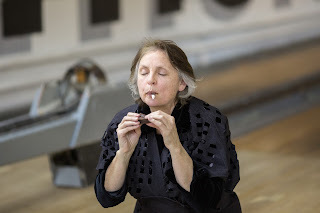 Sackville performances, Linda Rae Dornan. Caraquet March 2nd, is the last evening of PERFform 2017. • Even if confused, the audience picks up something which speaks to them. They also want to reach out and understand; and sometimes they just want to keep it to themselves and contemplate. • Mathieu and I haven’t enacted anything particularly violent, aggressive or loud in our performances, instead we have created a more contemplative environment with elements of transgression. We have also kept the works short so the audience’s attention remains focussed. • As much as I wanted to communicate through eating small chocolate tongues with embedded exacto blades, some people couldn’t watch me. The chocolate tongue performance is sensual and messy, nerve-racking and not polite. Everyone knows the taste of dark chocolate so watching me eat a chocolate tongue, licking, sucking, and pulling things out of it is voyeuristic, pushing the viewers into an awkward situation. The knife edge could cut me if I’m not careful with the way I am sucking the chocolate off of it. I am sticking my tongue out to display the blade and then the pearl. These are small gestures, transgressive gestures which are not normal behaviour in everyday life and yet they speak to the power of language to harm or to give within the web of our lives. Mathieu's charcoal and tissue performance also pushes boundaries - of waste, for example, and when he puts the charcoal in or on his mouth, it transgresses acceptable social behaviour. • As the tour progressed, Mathieu and my performance paces/timing/performative space began to complement each other more and more. • Performing in my home base (Sackville) was different. Certainly it was surprising who showed up! 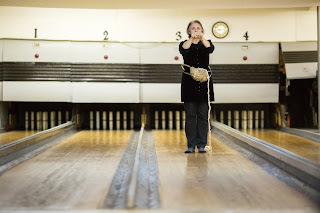 Struts Gallery sponsored us but the gallery wasn’t available so we used the old bowling alley at Thunder & Lightning. Both of us ended up choosing a bowling alley for a performance and the staging areas for our other performance. 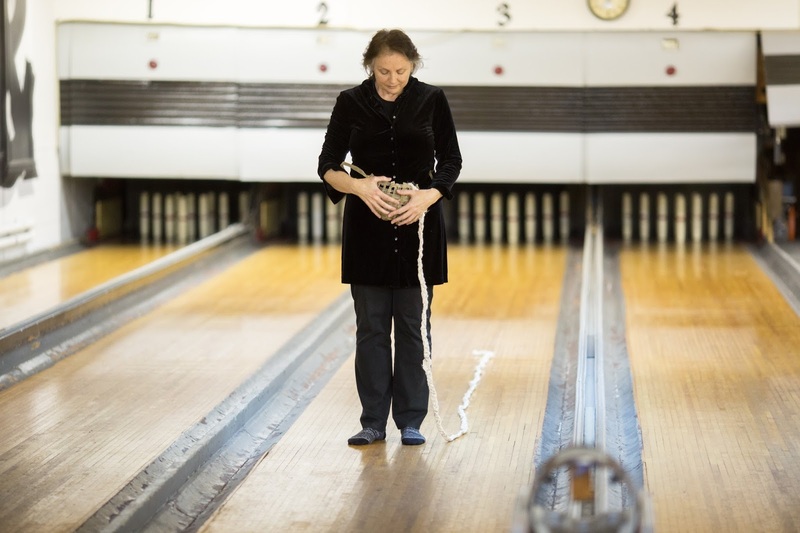 Also interesting is that we both chose to work with a rope image in the alleys (a 16 foot braid of words in my case and the rope performance in Mathieu’s). We have always worked our performances into the sites we have been presented with, and the bowling alley strongly displayed this. 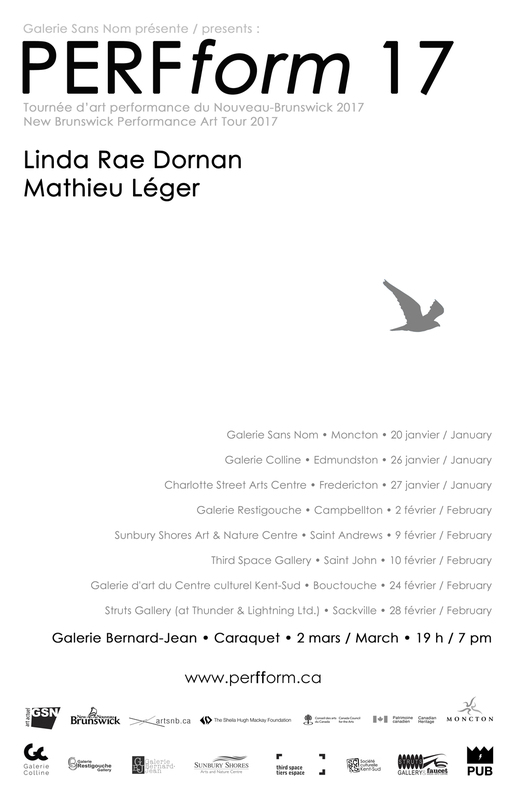 • In the last evening in Caraquet, both Mathieu and I stepped out of routines within works we had performed before. Mathieu blended his charcoal works of tissues and air filled paper bags; I changed the intent of the letter/post card performance and ended it with some harmonica playing (was it a memorial, a letting go?) Surprised myself as well. Equally as surprising was the response of the audience, following me through the space, on the floor reading the envelopes and post cards. • Metaphors are a dicey business. • Our performances live on in traces, the remnants of performance objects, and through sensations and memories. These objects, remnants, are now themselves performative, imbued with accumulated experience, representative of the absent performer, the absent body as well as its presence, remembered. They are a record and generate a discourse connecting experience with memory and ideas. • There is no way we can say one audience was better than the other. Each was particular to its own community yet each was also intense, supportive and curious. • Both Mathieu and I mined our personal archives to create these performances, and the experience has been transformative and satisfying. PERFform 17 • Caraquet • Dernière! / Last one! 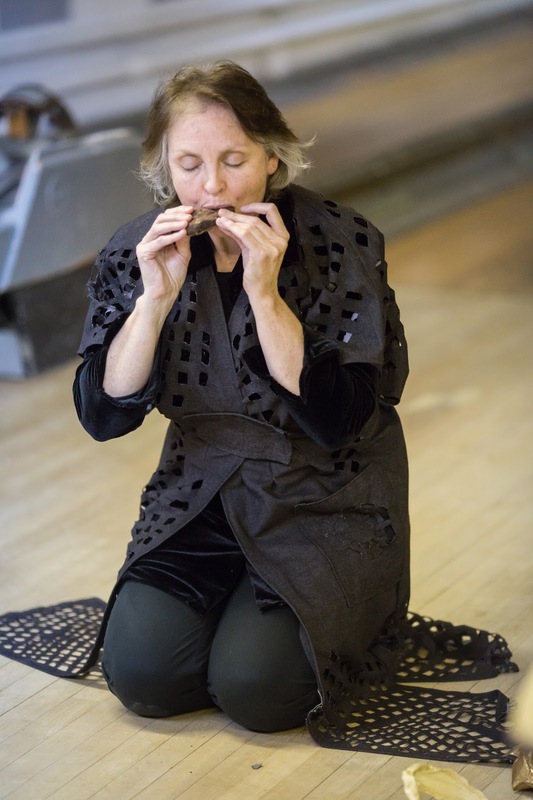 Ce soir, dernières performances de la tournée à la Galerie Bernard-Jean de Caraquet à 19 h! Tonight, last performances of the tour at Galerie Bernard-Jean in Caraquet at 7pm!